Wolfgang Amadeus and Constanze Mozart had two surviving children, both sons. Strikingly, neither ever married or (as far as is known) had children. The older son, Karl Thomas Mozart, became an accountant in the service of the Austrian government in Italy, but the younger, Franz Xaver Mozart, was referred to as Wolfgang by Constanze, who tried to turn him into the reincarnation of his famous father. He was, as the two concertos here reveal, a strong pianist, but as a composer he struggled with only intermittent success to get out from under his father's shadow. In the Piano Concerto No. 1 in C major, Op. 14, you can hear themes that sound like the elder Mozart if you don't focus too closely, combined in the first movement with a development section that stretches things out harmonically in the manner of Hummel, with whom the younger Mozart studied. In the later Piano Concerto No. 2 in E flat major, Op. 25, the influence of Hummel and Weber is stronger. 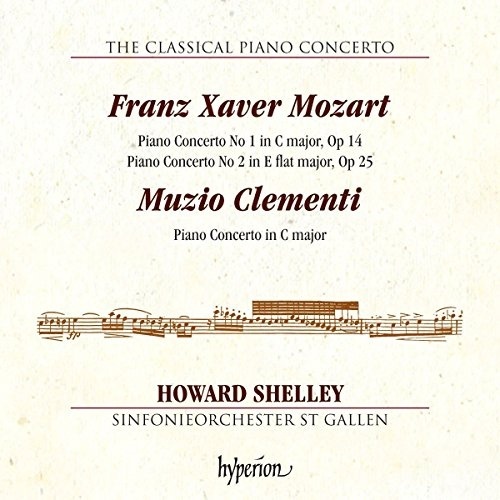 Both are reasonably attractive works if not masterpieces, but the find here is the little-known Piano Concerto in C major of Muzio Clementi, who grasped the less-is-more essence of much of Mozart's music perhaps better than Mozart's own son. Sample the high-spirited, dance-like finale, which sooner evokes Haydn than Mozart. The indefatigable Howard Shelley, so often featured on Hyperion's concerto releases, plays and leads Switzerland's Sinfonieorchester St Gallen, nicely recorded in its own home hall. Shelley is a versatile pianist, but this early 19th century style, emphasizing balance and fluency, seems to suit him particularly well. Recommended for those interested in piano music of the early 19th century.